Leonard Norris Foster was born in Covington Kentucky on February 2, 1951. He was a gifted athlete in high school playing basketball, football, baseball & track. The short guy with the tall afro, earned the nickname "Bananas" after the drink Bananas Foster. The five foot eleven infielder was known early on as a solid fielding prospect. Foster was signed by the Atlanta Braves in the second round of the 1969 draft. He made a brief debut with Atlanta in 1971 but then spent most of his time at AAA Richmond from 1971-1973. In his major league debut he made an error on the first ball hit to him st short stop. Later in the game he hit into a triple play as well as a double play. He was primarily a utility infielder getting into the Braves lineup in 71 games during the 1974 season, batting just .196. In April 1975 he was traded to the New York Mets for minor leaguer Joe Nolan. He played a year and a half at AAA Tidewater, batting a career best .287 there in 1976, playing at second, short & third base. 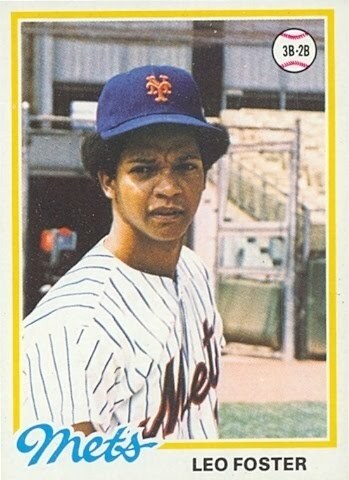 He got a call to the Mets in August of 1976, getting a chance from Mets manager Joe Frazier. Foster had played for Frazier at Tidewater the previous season. Foster debuted on August 1st, 1976 against the Philadelphia Phillies at Shea Stadium, drawing a walk in his first Mets at bat. The the second time up he singled, driving home Felix Millan, his old teammate from their Atlanta days. 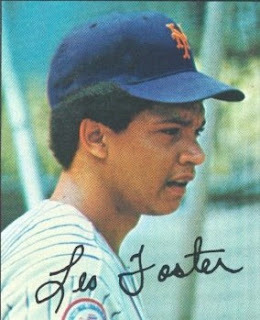 On the next road trip to Pittsburgh, Foster enjoyed brief success getting three hits, while driving in three runs in a Series at Three Rivers Stadium. On September 7th he hit his only Mets HR, it came at Wrigley Field in Chicago where he enjoyed a career day. Foster had three hits & five RBIs in an 11-0 Mets rout over the Cubs. On the 1976 season, Foster hit over .200, for the first time in his career, just making it by batting .203 with a HR & 15 RBIs. He played nine games at third base, seven games at short & three games at second. 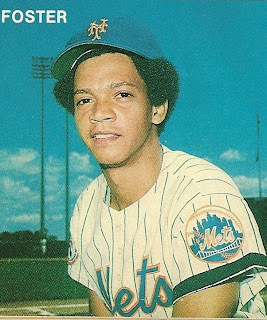 In 1977 he arrived back with the Mets in late April remaining there until May 22nd when he was batting just .133. He went to AAA Tidewater returning at the end of August hitting safely in three of his first four games back at the big league level. In September he played mostly at second base & hit safely in nine of fifteen games to finish the year at .227 with 17 hits, no extra base hits & six RBIs. In 1978 he was traded to the Boston Red Sox for Jim Burton who never cracked the Mets squad. Foster never played at the big league level again, retiring from the game after a season at AAA Pawtucket. In a five season career the utility infielder played 62 games at short, 33 games at second, 14 games at third & two games in the outfield. He hit a meek .198 with 52 hits two HRs 26 RBIs 7 steals & a .262 on base % in 144 games.